SUICIDE IS back in the news again with the release of the Monageer report and reports on the inquest of Rosemary Toole Gilhooley last week. The Monageer report documented the suicide of Adrian Dunne and the deaths of his wife Ciara and their young daughters Leanne and Shania at their Co Wexford home in 2007. Meanwhile, Ms Toole Gilhooley died in Dublin 2002 in what was believed to be an assisted suicide. Rev George Exoo and his partner, Thomas McGurrin, were investigated for assisting her suicide but efforts to have them extradited from the US in 2007 failed. The increasing rates of suicides and attempted suicides in Ireland in recent years and their impact has led to a range of responses at social, political and professionals levels. While some of these responses are aimed at suicide prevention in the general population, many, such as psychotherapy, are aimed specifically at helping the suicidal person, the family and those bereaved by suicide to address the issue in a constructive way. The impact of suicide and attempted suicide cannot be underestimated. Far from being an uncommon experience, many people think about suicide at some time in their lives and some consider suicide as a real option in times of severe distress. About 500 Irish people die by suicide each year while about 11,000 AE admissions are the result of suicide attempts. Suicide and attempted suicide also have a wider impact, affecting family, friends and community. It is estimated that in the region of six other people close to the deceased are affected by the death of a person by suicide. This reality is overshadowed by the social and moral stigma that still surrounds suicide. The taboo silences people, making it difficult for society and the suicidal person to acknowledge and address their experiences. This increases the sense of isolation, fear and anxiety experienced by the suicidal person and other concerned people. The psychological feelings of those who are suicidal include acute distress, fear, anxiety, helplessness, hopelessness and confusion. Socially the person can struggle to manage their daily and family lives and to continue with study or work, leading to financial and other worries. As a result, people often feel desperate, alone and misunderstood. Those who are aware of or suspect that someone is suicidal often have similar experiences. People in these situations frequently do not know where or how to avail of help for themselves or their loved ones. Indeed, due to the stigma associated with suicide, people often fear the type of response they might get if they seek help. The suicidal person may worry about being viewed as insane or inadequate while the family may be concerned about being blamed. It is important that people know that help is available and that recovery from a suicidal crisis is possible. Psychotherapy can assist the suicidal person to identify the sources of their distress, the resources and supports they need, and how best to approach their life situation in order to regain a sense of control over their own life and future. Psychotherapy can also help concerned family and friends identify how best to support the person in crisis. Overcoming a suicidal crisis may take time and psychotherapy can help all those involved to feel understood and to make sense of their situation. In circumstances where somebody has died by suicide, those left behind can frequently feel alone in their grief. While grief following suicide is similar in many ways to other bereavements, it is characterised by a strong sense of shame, blame, confusion and stigma. Sometimes it can be more extended and ambiguous and be accompanied by extreme and unexpected mood changes. While many of those bereaved by suicide do not feel that they deserve help or do not realise that help is available to them, psychotherapy can assist with the grieving process and with getting life back on track again. If you are concerned about your own suicidal thoughts or feelings, about a loved one, or you are struggling to overcome the loss of someone close, do not be afraid to talk. It will not do any harm and will probably help to alleviate your distress. Trained psychotherapists are available within the public and private sectors. The Irish Council for Psychotherapists is the professional body representing psychotherapists and it maintains a register of more than 1,000 psychotherapists who have undergone in-depth training and are committed to the highest professional standards. Accreditation as a psychotherapist generally requires at least seven years of training comprising a primary degree, a foundation year and three years’ part-time training in one of the psychotherapeutic disciplines. You can contact the Irish Council for Psychotherapy at 73 Quinn’s Road, Shankill, Co Dublin or visit the ICP website at www.psychotherapycouncil.ie where you will find the register and contact details of trained and experienced psychotherapists all over the State. Evelyn Gordon is a registered psychotherapist, a member of the Family Therapy Association of Ireland and the Irish Council for Psychotherapy. She is currently undertaking a PhD in suicidology at Dublin City University and is part of the Research Team on a HRB-funded Suicide Project at the School of Nursing, DCU. “Those left behind can frequently feel alone in their grief. While grief following suicide is similar in many ways to other bereavements, it is characterised by a strong sense of shame, blame, confusion and stigma. An umbrella group representing over 5,000 counsellors and psychotherapists in Ireland has called on the government to introduce statutory registration for their profession in this country without delay. This afternoon (September 23, 2008) the Psychological Therapies Forum presented agreed recommendations for the statutory training and regulation of counselling and psychotherapy to Mr. John Maloney, T.D., Minister of State at the Department of Health & Children with responsibility for mental health. They called on the Minister to include statutory registration of psychological therapists in the next phase of the Health & Social Care Professionals Bill 2004. The Bill already provides for the statutory registration of 12 other health and social care professions including psychology and social work. The Psychological Therapies Forum is seeking a registration board titled “Psychological Therapists” for counsellors and psychotherapists and has recommended baseline academic qualifications for entry to training and baseline qualification and experience for registration and for grand parenting practising practitioners. 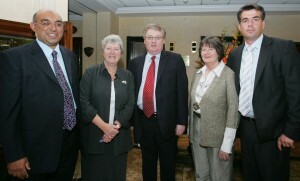 “We believe it is imperative that the public is protected by promoting high standards of education, training, competence and conduct among the counselling and psychotherapy professions.” Forum representative, Derval Ryan told the Minister at the presentation of the submission to him in the Davenport Hotel, Dublin. She said that at present this protection is provided by a process of self regulation by a number of professional organisations which lay down for their members strict standards of on-going education, training and ethics as well as a complaints system to protect the public. In November 2005, Mr. Tim O’Malley, the then Minister with responsibility for mental health initiated a consultation process on the statutory regulation and registration of counselling and psychotherapy in Ireland. He requested the organisations to engage in a process that would result in an agreed framework for standards within these professions. He said this work should be carried out with a view to including counselling and psychotherapy in the next phase of the Health & Social Care Professionals Bill 2004. Following the Minister’s request, the Psychological Therapies Forum, which represents the professional organisations for psychotherapists and counsellors in Ireland was formed and has spent the last three years drawing up the current submission to government. John Farrelly who chaired the event, concluded that “The recommendations we have made here today should create a consensual and smooth pathway into the future, ensuring Ireland is at the cutting edge of psychological therapy while offering the public optimal protection. The emerging consensus is that psychological therapies should be regarded as fundamental to mental health services at primary, secondary and tertiary care levels. Psychotherapy in Ireland is regulated by the Irish Council for Psychotherapy. We have currently over 1,050 psychotherapists on our register, which can be accessed via our website, www.psychotherapycouncil.ie. ICP standards are in line with the European Asso­ciation of Psychotherapy, and accreditation as a psychotherapist generally requires at least seven years of training, a primary degree, a foundation year and three years part-time training in one of the psychotherapeutic disciplines. The total duration of the training for psychotherapists accredited with ICP is 3,200 hours, spread over a minimum of seven years. There are five Modality Sections of the Irish Council for Psychotherapy: humanistic and integrative, cognitive behavioural, constructivist, systemic family therapy, and psychoanalytic. All sections have codes of ethics which oblige therapists to uphold a high standard of professional competence and personal conduct in their practice with their clients and each section also has a complaints and disciplinary procedure. We are at present seeking to have our profession statutorily regulated and are currently working with other mainstream psychotherapy organisations on proposals in this regard which should be ready for submission to the Health Minister next month. Ireland urgently needs a fully funded national psychotherapy service which would be both an effective and cost effective way to treat a wide range of Ireland’s current mental health problems. In the meantime, the Irish Council for Psychotherapy maintains a register of over 1,000 qualified highly trained psychotherapists, who are both accessible, ‘user-friendly’, and skilled in dealing with the emotional disturbances so often tragically highlighted recently. Unfortunately, owing to the lack of a public service, the majority are in private practice. There is little or no provision of psychotherapy for public patients and we really need psychotherapeutic services provided by the HSE for those who cannot afford such services, according to Dr Brion Sweeney, Chairman of the Irish Council for Psychotherapy. Speaking at the Healing the Hurt event during the national conference of the Irish Council for Psycho­therapy in Dublin Castle recently, Dr. Sweeney said the provision of psychotherapy is largely limited to the private sector. Dr Sweeney, a consultant psychiatrist, specialising in drug and alcohol abuse, said psychotherapy can be valuable in treating conditions ranging from anxiety disorders to substance misuse, depression, agoraphobia, or more severe mental health problems such as schizophrenia and bipolar depression. In addition, Mr Dan Neville, who is Chairman of the Irish Association of Suicidology, deplored the absence of psychotherapists in the Irish psychiatric service. He said the Irish College of Psychiatrists told an Oireachtas committee that 83 per cent of psychiatrists did not have a psychotherapist available to them. Â He said that there was an urgent need to establish multidisciplinary community psychiatric services, as first recommended 22 years ago in the Department of Health report Planning for the Future and again in the Vision for Change document published in 2006. He added that there was a need to develop other therapies such as family therapy and occupational therapy. There are a number of reasons why primary care is seen as a pivotal role in the delivery of care to modern populations. In a sense, it reflects the development of medicine beyond the paradigm of diagnosis and treatment to one of risk identification and management. This is very good news as it has the potential for prevention of illness and for prevention of progression of illness, if managed properly. For example, proper management of blood pressure or indeed diabetes can ameliorate the risk of these conditions down the line. In the area of mental health too, there are huge opportunities for primary care in identifying and managing risk. Primary Care is well placed to deliver early intervention and thereby prevent more severe and chronic illness later on. General practitioners are being resourced, both in terms of diagnostic facilities and the building of multi-disciplinary teams in order to enhance the capacity to provide specialist primary care within the context of family and community. In a context where there is huge demand on funding and where healthcare provision has become increasingly expensive, it is very necessary to target interventions that are effective. It is reasonable that evidence therefore should drive funding and resourcing.Â Â Under the economic pressures of the 1970s and 1980s there was a withdrawal of resources from psychotherapy provision and psychological intervention because there was an insufficient evidence base to justify such interventions. Twenty years on, the evidence for psychotherapy and psychological interventions in general has been greatly enhanced. The flood of evidence for psychotherapeutic interventions continues to grow. The first modality to show significant evidence has been Cognitive Behavioural Therapy.This is in part because these interventions being already standardised have lent themselves easily to measurement, and also because practitioners working in this area have been trained from an early stage to understand the need for scientific investigation of the method.Â Evidence has accumulated for brief interventions using other theoretical frameworks for example Motivational Interviewing based on Client-Centred Psychotherapy (Humanistic/Rogerian) and perfected by William Miller and collaborators (Miller,W et al). In a recent review of the literature on psychotherapyÂ Professor Alan Carr, of UCD (Professor Alan Carr:Â â€œThe Effects of Psychotherapy: A Review of Research) on behalf of the Irish Council for Psychotherapy in press), has shown other methods, including Systemic and Family Psychotherapy, Constructivist Psychotherapy and Psychoanalytic Psychotherapy to be effective in a broad range of mental health disorders. There is also evidence emerging that slightly longer interventions, of perhaps six months to one year, can bring benefit to the more complex problems. For example, Psychoanalytic Psychotherapy has been shown to be effective with more disturbed patients who would normally attract a diagnosis of personality/developmental disorder. In a primary care context, perhaps there are certain conditions which are particularly important to highlight where evidence based psychotherapy interventions can be of assistance to general practitioners in their care of patients.Â In particular, of course, we must start with the mention of Cognitive Behavioural Therapy for affective and phobic disorders and more recently, increasing evidence of their effectiveness in intervention with substance misuse disorders (Carroll and Onken). Often in primary care, the question of prescribing medication arises, in particular, prescribing of benzodiazepines. It is understandable that GPs have become increasingly reluctant to prescribe benzodiazepines because of the abuse potential and because of the fact that many patients can become dependent on these substances.Yet, with patients who present with phobic disorders or anxiety or panic disorders, often GPs have little alternative but to prescribe. The provision of psychotherapy services gives a real alternative route of referral.Â It is shown in the pilot study in the North East, that GPs will use these referral pathways and that patients would benefit, thereby avoiding prescribing of benzodiazepines and the longer term dependence, which those who suffer from anxiety disorders can so easily develop. It is also clear from Government strategy review on Suicide that the vast majority of those who kill themselves never have any contact with mental health services and are most likely to have visited their GP in the month prior to the suicide. It is a truism, and well understood at this point, that young males are at seven times higher risk of suicide than females. It is also clear that these young men are quite unwilling to access the necessary support. It makes sense, therefore, that outreach to such vulnerable young men, and indeed women, is more likely to be effective if provided in a user friendly primary care context. Primary care is particularly well placed to provide such intervention, as patients are most likely to approach their General Practitioner in the first instance with such difficulties.Â Having on tap a well trained psychotherapist whom the GP can confidently refer such complex cases makes sense. These types of interventions are envisaged in A Vision for Change the expert report on Mental Health Services 2006. Such interventions may be highly significant in those who may be contemplating suicide. Prof.Apleby in a psychological autopsy of 100 persons who killed themselves in Manchester concluded that acute on top of chronic relationship problems were co-factors in completed suicides. In conclusion with the increasingly important role that primary care is playing in the provision of health care within our society, then primary care needs to be resourced to play this key role.Â Such resourcing would ideally include the appointment of a well trained professional psychotherapist as a member of each primary group care team.Â The argument for a psychotherapist in this context is that they can work with a range of complex disorders which are increasingly faced by General Practitioners.Â This may be everything from anxiety disorders to substance misuse, depression, or indeed, more severe mental health problems such as schizophrenia and bi polar depression. If we are going to really see primary care as the backbone of healthcare delivery, then we need to resource primary care to deliver comprehensive services at a community level.Â This will only happen when we have the range of specialist skills that are required to handle the range of problems that present in general practice.Â Many surveys have shown that up to 40% of those who consult with General Practitioners have a strong psychological component to their presentation.Â There have been further studies that have shown that where patients are provided with psychotherapy, their attendance at A & E departments is greatly reduced, and also their recurrent presentation in the primary care setting is decreased. At present, the HSE is planning that such psychological therapy will be provided.Â Professor Carrâ€™s paper has outlined that longer term therapy may be appropriate for certain groups of patients, while brief manualised interventions may be most useful for certain disorders. Â The Irish Council for Psychotherapy (ICP) is playing its part in terms of ensuring that psychotherapists are properly trained before they are entered on the Register.Â ICP is working with the Government to bring in statutory regulation and registration for all psychotherapists.Â Effectively, the psychotherapy area has become a self-regulated profession, ensuring a certain quality of standard of training and practice.Â This includes a four year part time post graduate level specialist training in psychotherapy; working under Ethical Codes and Guidelines. Psychotherapists are therefore well placed to be key members of primary care teams, and greatly enhance the options available to General Practitioners and their patients. Dr. Brion Sweeney is Chairman of the Irish Council of Psychotherapy and a consultant psychiatrist specialising in substance abuse.